Well…that is me…the man walking down the street that is soft in the middle while the rest of his life is so hard. I am on this “Downhill Climb” journey so that I don’t end up a cartoon in a cartoon graveyard. (Ever seen my Sumoflam logos??). Of course, I have been taking hundreds of photo-opportunities for a shot at redemption and many of them make their way into this blog and some of my others. Yesterday was another “no walk” day. 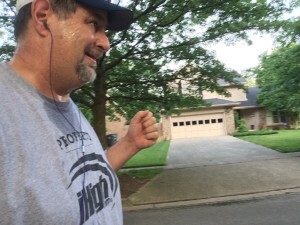 This time there were no excuses, just the dreaded heat index of over 100 degrees. 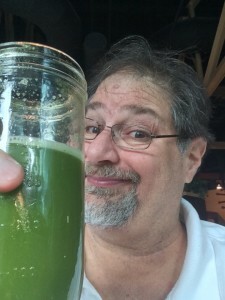 But, I did have some “Mean Green Juice” (another Joe Cross juice recipe) for breakfast. This stuff is strong…but I am getting used to it. And it is helping me. 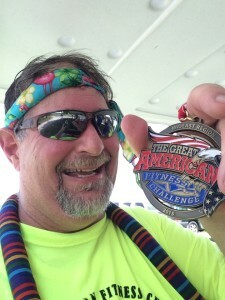 More than 20 million people around the world watched Joe Cross juice his way across America, losing 100 pounds and getting off medication in Fat, Sick & Nearly Dead. The film ignited a juicing movement. Viewers around the world have been inspired to start juicing, lose weight and get healthy – and as a result of the film over 370 million glasses of fresh juice have been consumed, 370,000 tons of fruit and vegetables consumed, more than 24.8 million pounds of weight lost, and over 220,000 people are now medication free. Thanks Joe Cross for the inspiration! I also have been craving some snacks lately so today I snacked on Ezekiel bread with Sriracha infused hummus. 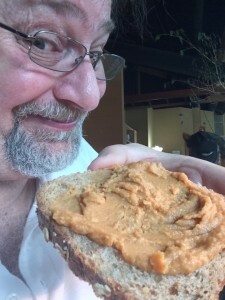 May look like peanut butter on that bread, but it isn’t! And the Sriracha Hummus is to die for. The more capsaicin the better, in my humble opinion!! The hummus we make at home actually has no oil in it. I am not sure what else Julianne puts into it, but it does have the texture of a smooth peanut butter, without any of the oil. We use hummus as a dip, a spread and more. I really have grown to love this wonderful product made from garbanzo beans (chick peas). The Huffington Post, famous for its many lists actually lists 10 Reasons why we should all be eating more hummus. And, in a nutshell, here they are…with no explanation. You can read the entire article link above to see the details. 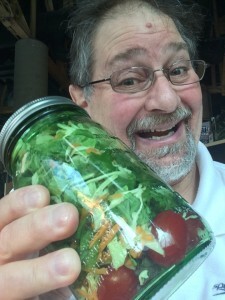 Along with my snack, I am back on Salad in a Jar. It is another great thing to indulge in. Just a simple salad and a few fresh cherry tomatoes fills up a bowl and makes for a healthy lunch. We found some jalapeno mustard the other day at Fresh Market and made our 3-2-1 dressing and this is really flavorful. Salads are better with the sweet, hot acidity of the dressing. So, I am still on track. Though I didn’t get a walk in yesterday, my intent was to walk this morning, which I did and which I will report on in tomorrow’s post. Suffice it to say that I got in a 3.3 mile walk early this morning. The Downhill Climb continues!! Watch for good news tomorrow as I move closer to my #400Independence Day!